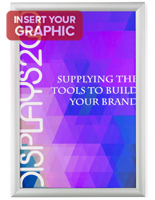 This Swinging Poster Case is Made for 24" x 36" Graphics! Additional Sizes, Colors, & Styles are Available! Buy a Metal Poster Case Now! Exhibits 24" x 36" posters when matted, creating an eye-catching display. 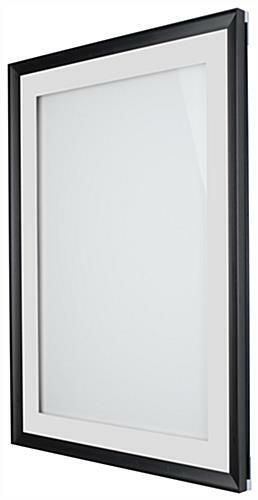 Hinged door design to make updating signage a breeze. 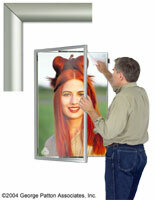 Swing poster case is made of aluminum for durability and affordability. Acrylic lens keeps the graphics free from dust and fingerprints. (1) Black and (1) white mat are including for accenting any signage. This poster case with (2) mats has a brushed black finish. The most common places to spot this marketing display are restaurants, shopping centers, colleges, corporate offices, and more. 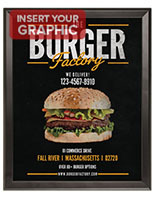 This swing open poster case is the best size for attracting patrons in high traffic areas. These swing frames are used for promoting sales, showcases samples of work, displaying art or menus, and more. Each POP display is a poster case that is made for speedy and simple changes with the pivot design. 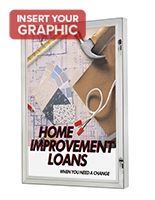 Users can change out the graphics in no time without help. This swinging poster display includes (2) mats. 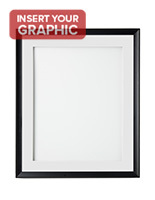 There is (1) white & (1) black matting included for consumers to choose the one that best accents their artwork. 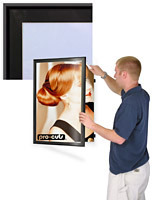 Each poster case with a clear panel will guard the images on display from becoming damaged. The acrylic lens will stop the graphics from getting in contact with fingerprints or dust. Each swing frame is a poster case that hangs vertically or horizontally on the wall. Consumers have many options for displaying the holder including the different mattings and mounting orientation. 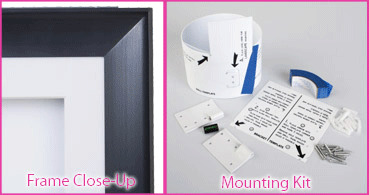 This poster case is sold with a template to assist users with the mounting of the unit. 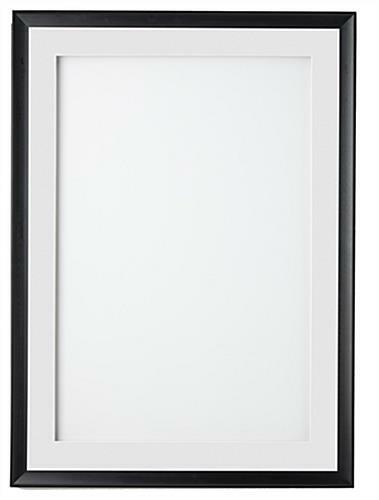 Users who hang this display on the wall with (2) people and the template as a guide will find the procedure a simple task. Each picture hanger is a poster case that is available for bulk purchase. The option to buy several units at a discounted price is ideal for businesses that use several units at one time. Most in stock items, such as this advertising tool, will ship fast. Please Note: Two people are required for mounting this display. 31.5" x 43.5" x 1.3"